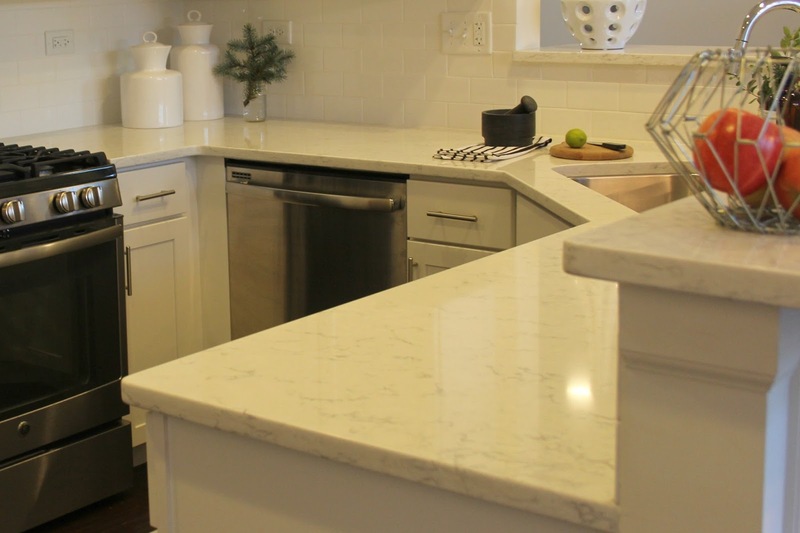 How to choose the perfect color of quartz for kitchen countertops or bathroom countertops? Not always the easiest task. There are tons of choices. But I’m here to help! Why your ultimate choice matters. 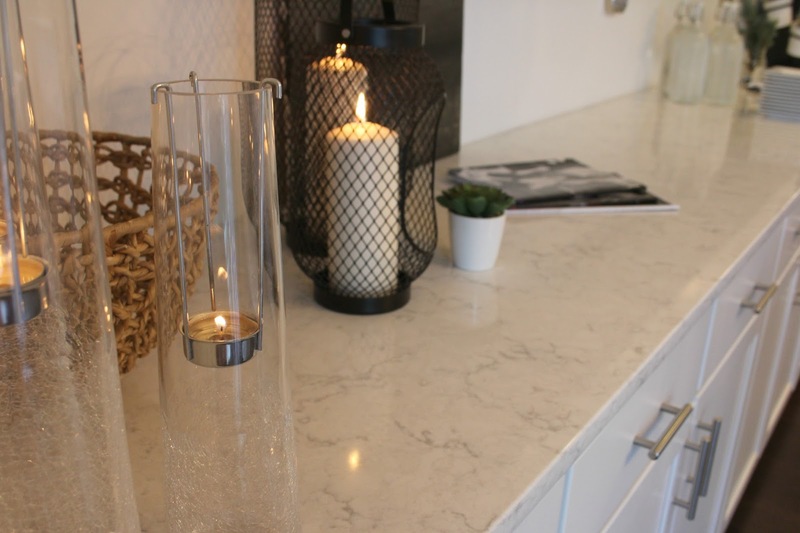 Not only are new kitchen countertops a hefty investment, but that quartz counter choice you make for your kitchen design is going to greet you every morning and evening in the kitchen…a space which has surely evolved into America’s new living room. 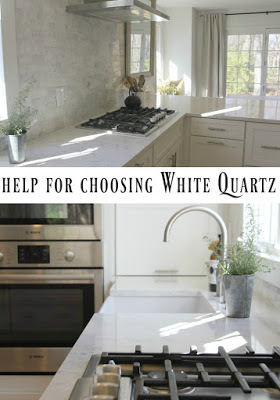 Even though I concentrate on white varieties of quartz in this post, the guidance actually applies to choosing any hue of quartz countertops in your design plans…Here’s my kitchen with Viatera Minuet quartz countertops, and in this story I’ll guide you through the selection process. This is not a sponsored post, just me sharing my story…I did pop in a couple of affiliate links for a sink and faucet (using the links won’t cost you extra, yet I’ll earn a small commission). 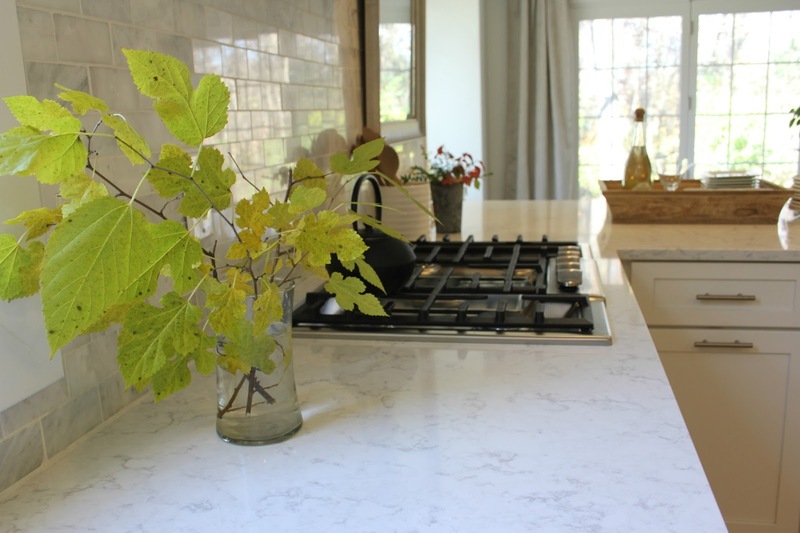 HOW TO CHOOSE THE BEST COLOR OF QUARTZ FOR COUNTERTOPS. (photo: Hello Lovely Studio) Faucet is here. Sink is here. and brought home quartz sample after sample. It was a quite the quartzy season. Here’s the thing. the cabinetry made it look too creamy. So that quartz color choice was out. lighting came off completely wrong in my humble, Northwest exposure (not showroom lit) kitchen. fell flat when placed next to my white kitchen cabinets. the passenger seat next to me on the drive home. colors from the LG Viatera line came into my life! Option No. 1: Viatera Cirrus Quartz. (above) Cirrus is dreamygorgeous and has this ethereal, marshmallow-y, subtle painterly feel about it that made me want to stare and touch it. (Don’t judge and don’t you dare forward my contact info to the producers of that “strange fetish” reality TV show!) 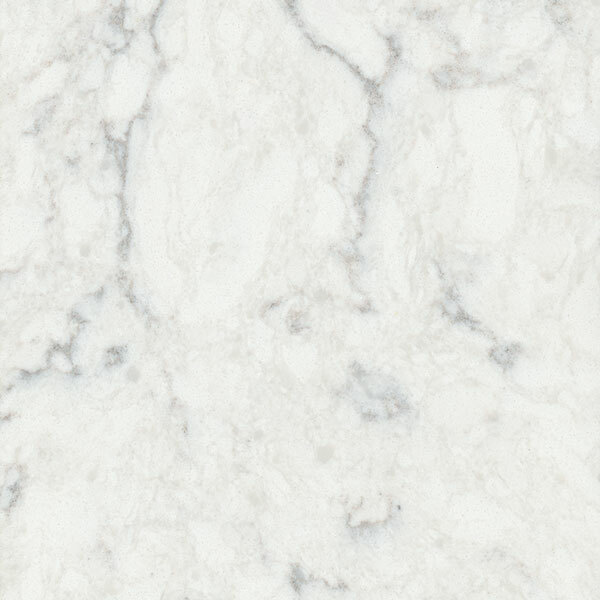 I was almost certain Cirrus was my dream quartz color for my white kitchen. light grey marbling, and reflective beauty. in a minuet, and me oh my, does it sing in the kitchen. How did Viatera MINUET Quartz Win Me Over? all the other quartz colors on the spectrum of whites for me? My Kitchen: Faucet is here. Sink is here. Viatera MINUET quarts countertop, farm sink, polished venatino marble mosaic backsplash. My budget was tight, and quartz can get pricey. since we’ll be living with the choice for a long time. my top choice also came with the friendliest price tag…score! list at this fixer upper, I needed the break. 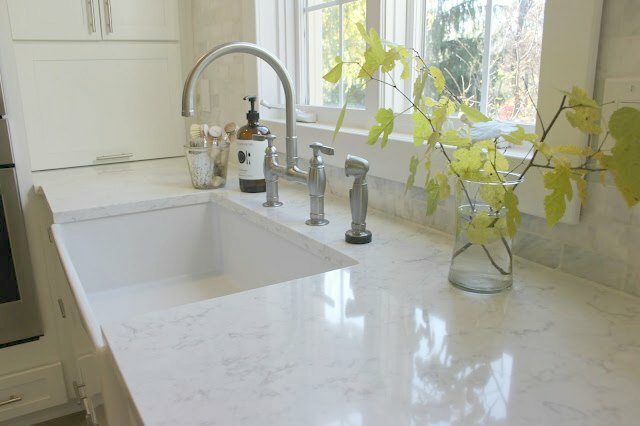 My Kitchen: Viatera Minuet quartz countertop, Faucet is here. 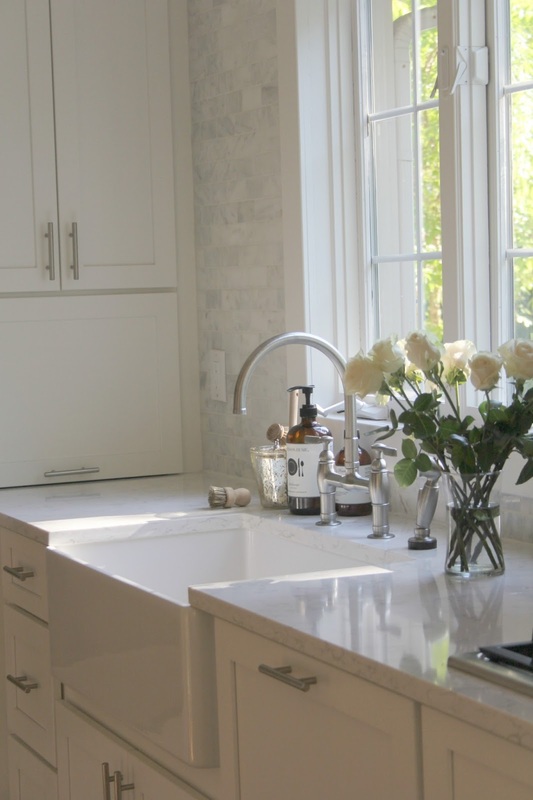 Sink is here, Shaker style cabinetry, and white roses. Second, a word about the perfect white. Viatera MINUET quartz was the whitest white without being a complete white out. If you have shopped for quartz, then you know what I mean! 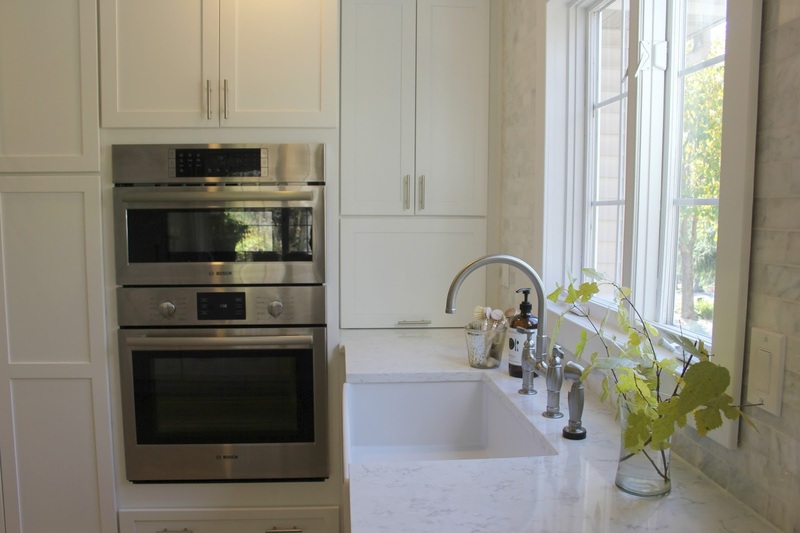 Solid white can be awesome in the right modern kitchen design context, but when you are going for a stone look with some veining to keep things natural looking and forgiving, the solid white may be all wrong. Third, Viatera Minuet quartz was a winner for being the most reflective choice. mosaic for the wall as opposed to honed marble. factor for our kitchen which, as you can see below, truly needed the love! in how it works with natural white marble. with Minuet since I wasn’t interested in contrast. and other natural stone I brought home. 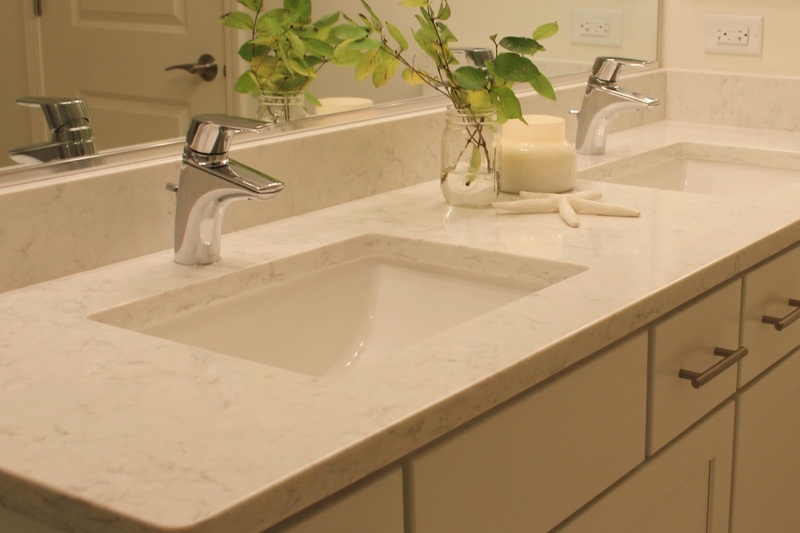 Choosing the Best Color of Quartz for Countertops – Faucet is here. Sink is here. Fifth, I got to see Viatera Minuet in a real life kitchen. 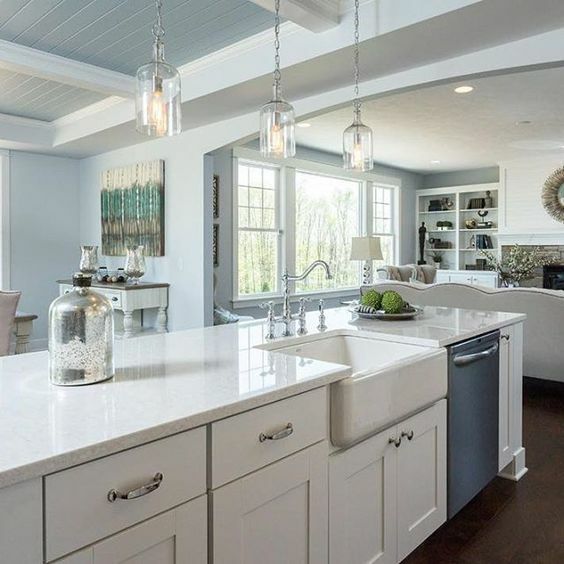 My sister was designing her own kitchen and baths around the same time I was doing mine, and she chose Minuet in her brand new build for the kitchen and a couple bathrooms, so I was able to see expanses of it installed which is MONEY. Kittycats, quartz ain’t foolin anybody as a marble poser. Ye shall not stain the countertops at Maison Lovely, Red! I am quartzhappy because of its stain resistance, uniformity, strength, non-porous, no-maintenance nature, antibacterial properties, and lovely live-ability since we can surely anticipate red wine spills, and limes sliced directly on naked kitchen counters when madame Lovely is not present to police criminal lime slicing behavior. PIN me to help other folks searching for a good white quartz!!! And if you are seeking kitchen design or kitchen decor inspiration, you are in the right place! Click here for lovely kitchen ideas! p.s. I found a little steel cart to us as a work table that was the perfect size to be topped with the Minuet quartz cut-out from my farm sink. The fabricator had finished the leftover piece on all sides (bonus). I painted it with this Paris Grey chalk paint then added salvaged maple floor boards we had salvaged from the kitchen floor when we demo’d it. The sink cut-out piece fit perfectly on top and is heavy enough that no adhesive was necessary. You can see it on my IG here. I used Hanstone's Victoria Sands in the in-law apartment we added to our home 10 years ago. Ahead of the curve! It looks like the day it was installed. 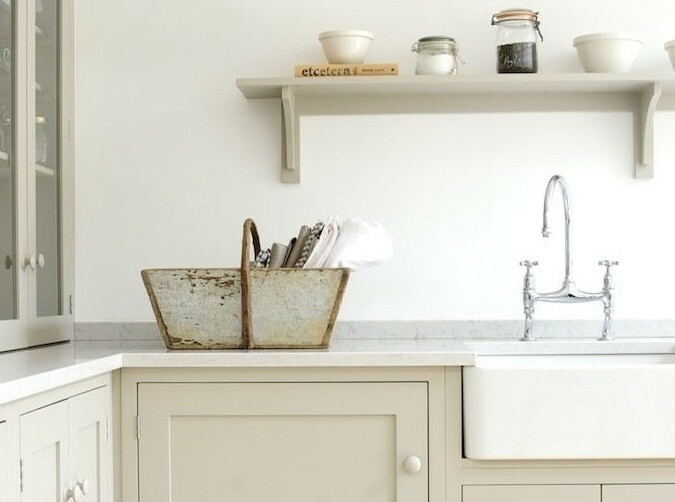 Our own kitchen is being renovated at the moment, I ordered Silestone's Bamboo to complement cabinets in painted in SW Dover White. I am going for a warm neutral look. I love a warm neutral look-sounds perfect. And I love Silestone too for quartz. In the last house, I went for warm finishes and used their Ivory Coast which was reminiscent of the beach. And yep, it looked as good when we left as when it was installed 9 yrs ago! It is a perfect choice for both of you girls. I was singing the same song when it came time to choose our counters and declined many for the same reasons you did. I wound up getting Lyscom by arizona tile, very similar to yours with less movement, soft, lovely, clean looking all the necessary qualities I love in a kitchen. Next I get to choose a backsplash time after the first of the year. Of course it is subway, white or carrera marble, we shall see.!! Love your kitchen and your sisters, so much!! Hi! Love it all! In the first and last kitchen picture, what was the back splash you used? Sorry I'm seeing this so late! 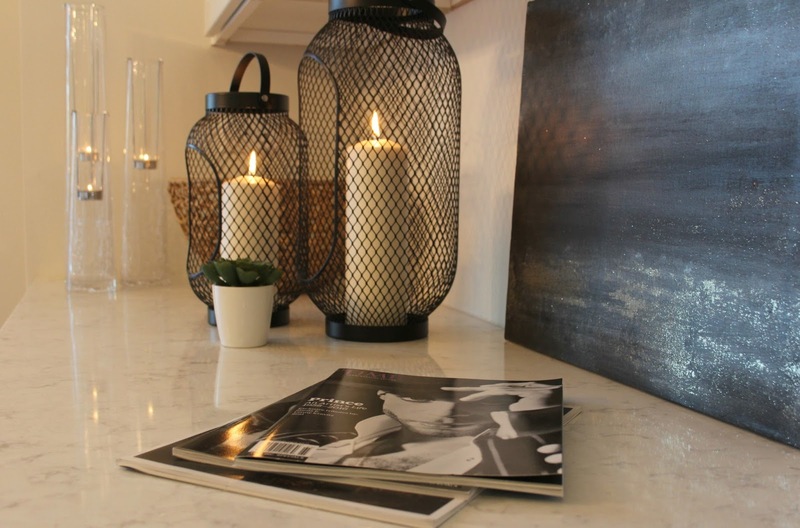 In our kitchen, it's a polished venatino marble mosaic tile from Lowe's. In my sister's kitchen, it's a white subway ceramic tile. hope this helps. Hi!! I am doing the Minuet in my kitchen and am very excited about it! What backsplash did you use for the first and last kitchen? my kitchen: a polished venatino marble subway mosaic tile from Lowe's and in my sister's a white subway ceramic tile. good luck on your Minuet kitchen! I'm filing all this great information away since I'll be going through this process too. Thank you! This came at the right time. We are renovating bathrooms and just decided last night that as much as we love the Carrara look and feel, it's too fussy for our busy household with two teens. Minuet seems like the right fit and your description nailed it! 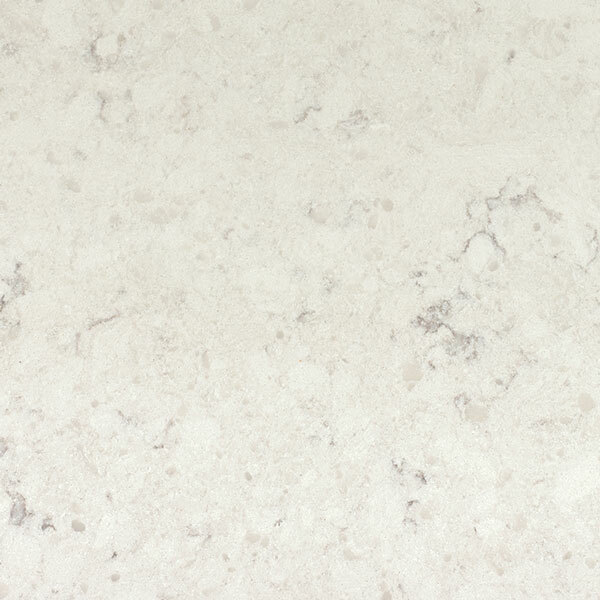 We are thinking of using LG Minuet quartz in our kitchen. 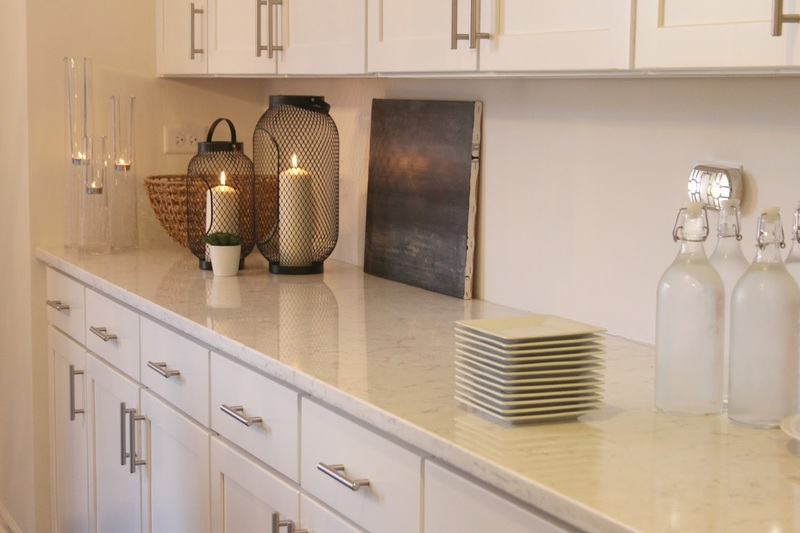 What color of cabinets did you use with that quartz in your kitchen? Thanks! Hi ! What thickness did you use? 2 or 3 cm? And what type of edge? Thank you! I found this at Home Depot of all places, was looking at images, and found your blog. Very helpful! What thickness are your counters? 2 or 3 cm? And what style of edge? Very helpful blog. Thank you!! Thanks so much for visiting, Jenre! The quartz is 3 cm, and the edge is the plain old standard edge. 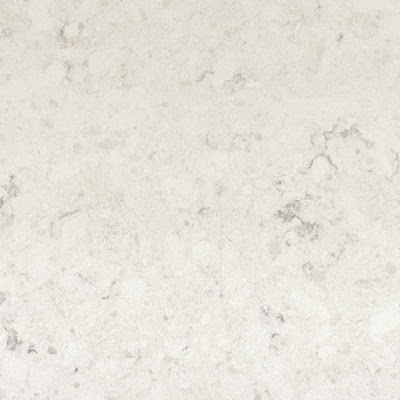 I just did Viatera quartz in our Arizona kitchen, and they do things different in that part of the country: for that counter, it was 2 cm for the product which the fabricator then built up to (I think) a thicker edge than I have here in Chicago! I think 3 cm is sort of normal for most projects outside of the southwest. We are planning to install Minuet in our kitchen. How has it held up for you? Any staining or chipping? Have you accidentally left anything (sauce, wine, coffee) out on it and did it stain? Thank you! I did find one small chip in the last 2 years with it, and maybe it could be repaired but it isn't bothering a thing and not noticeable. My guys have left sauce and ??? and red wine and nothing has stained it. There is some scratching from so much use but nothing I feel needs to be buffed out after 2 years. Hope this helps! We are planning on installing Minuet in our kitchen. Have you had any issues with staining or chipping? 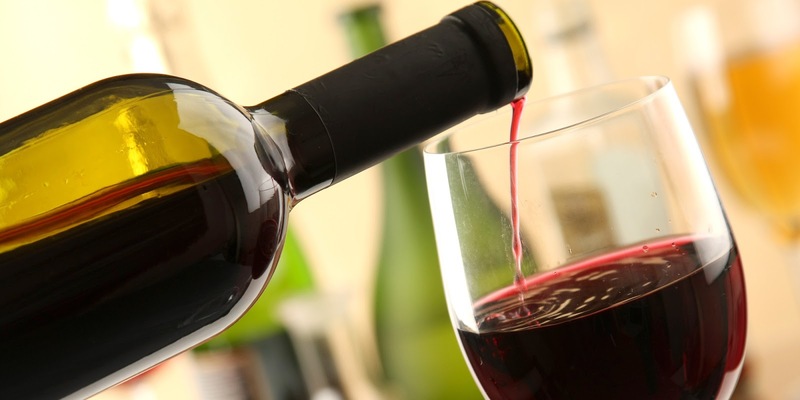 Have you accidentally left anything (sauce, wine, coffee) on it for a while and did it stain? Thank you! Hi Patricia. See the above reply. I'm still happy with it despite some subtle scratching and a little chip. I think these issues can be remedied, but they don't bother me. I would recommend always using a cutting board to prevent scratching. The chip is probably from my husband dropping a heavy tool on it…so avoid that too! This kitchen gets a lot of abuse since we have done a whole house DIY. Hi Laura! Woohoo! We used a 12" mosaic tile so the subway pieces are approx 2×4 each. 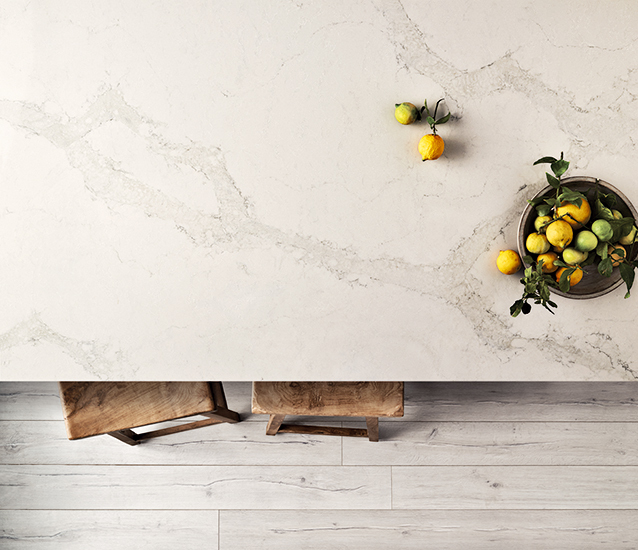 You can still buy it from Lowe's…Allen and Roth polished venatino marble. Our farm table is huge and custom made from barn wood. 7 feet long and 38" wide. I am using it in my studio now and we have a small round in the space now. Let me know how your kitchen turns out! Beautiful! Love it! What color grout for your marble backsplash? tahank you! a bright white. which is preferable Zodiaq London Sky or the Minuet for South facing kitchen with White Dove cabinets and dark walnut floors? Hi Michele, I too am in the Chicago area. Where were you able to locate the LG? I would love to see it in person. I think our project calls for the same white quartz from how you are describing it. Thanks so much! Thanks for this post. I’m waiting for my countertop (Minuet) to be installed. Someone just told me that white quartz yellows after a while and since I have a double tiered counter (like your sister’s I think), I also heard that the seams show. I couldn’t tell from the pictures if this happened or not. Thanks for your reply. Thanks for this post. I’m waiting for my countertop (Minuet) to be installed. Someone just told me that white quartz yellows after a while. Have you heard of this? Also, since I have a double tiered counter (like your sister’s I think), I also heard that the seams show. I couldn’t tell from the pictures if this happened or not. Do they show on hers? Thanks for your reply. Awesome info and a funny read throughout! The “Over the Hill Olsen Twins” captioned photo was particularly funny. Hello! I have been trying to decide between the Viatera Minuet and Cirrus for weeks. I’m leaning more towards the Minuet because the Cirrus doesn’t have much veining and I worry that it will just start to blend in to me. Do you by chance know what color paint your sisters cabinets are? I saw you have white icing from an above post. My floors and backsplash are almost identical to hers! Thank you!! Beautiful kitchen. 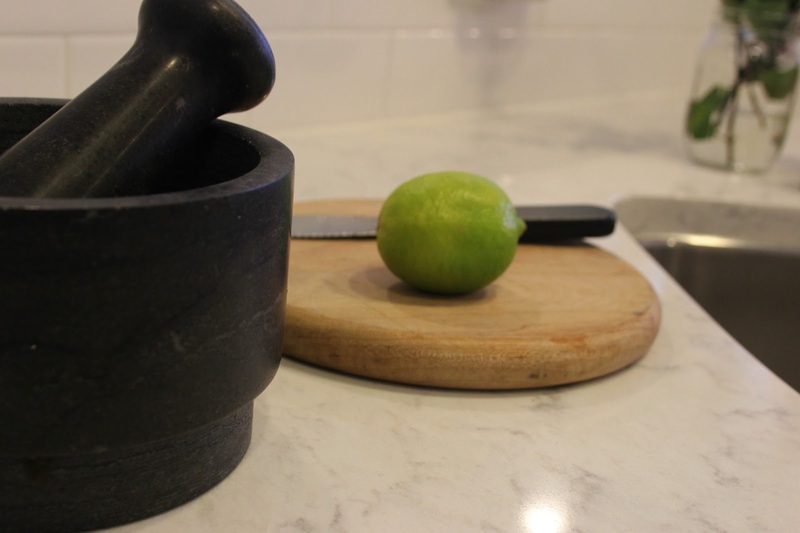 Love your countertop choice. I’m presently shopping for flooring as well as countertop material and wonder what you chose for your kitchen flooring. Thanks, Donna. Hi Donna. Thanks. 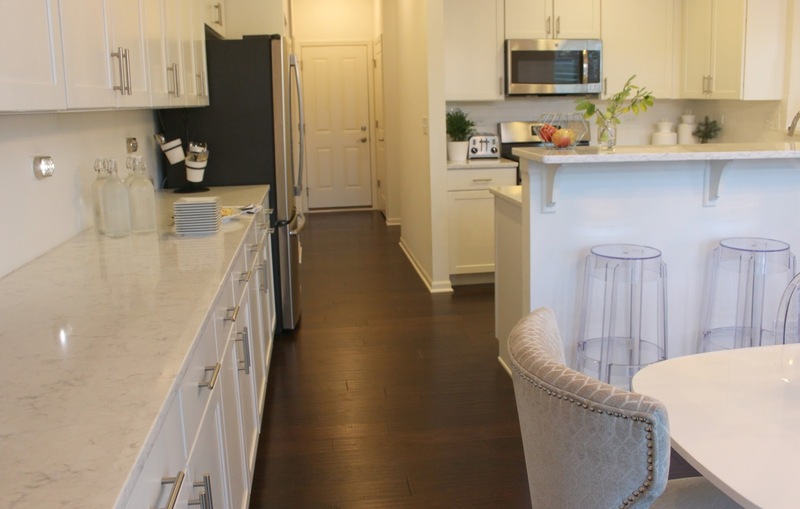 It’s white oak 5″ wide hardwoods with no stain, finished on site with a matte finish. Did you ever look at lg muse as an option? Debating that and lg minuet. Thanks! Muse is gorgeous, Kristen! It imparts a completely different look even though the color seems similar. 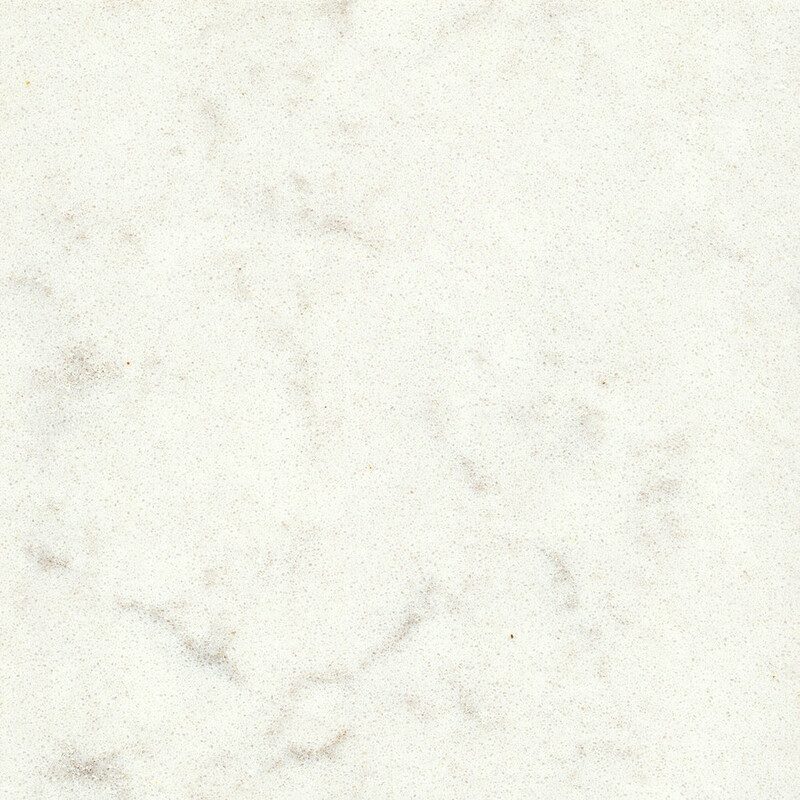 Muse is mimicking Calacatta marble and has large scale veining as opposed to Minuet’s finer and more delicate veining. I think Muse would be gorgeous on a huge island and in bigger kitchens, but I feel like Minuet suits my smaller Euro inspired kitchen which doesn’t have a big island since it feels like it belongs in a Paris bakery. Hope this helps, and thanks for adding to the beauty and discussion here…it always helps more people than you can imagine! What color are your kitchen cabinets?! Trying to find the best white for these counter tops! Hey Blair – I emailed you, and in case others need the answer: Our kitchen cabinets are bright, pure white, called “white icing” by Schuler, the maker. I think for a similar effect with Minuet, as long as you stick with whites or off-whites with cool, grey, or no undertones, you’ll be pleased. Creamier or antique whites have yellow undertones which may not be the look you are after with the clean white of Minuet. Thanks for reading! I know you said that Jody’s kitchen cabinets were a bright white, but any idea on the actual color name/brand she used? It’s also very close to my colors and I’m trying to figure out what color to do my cabinets. Thanks! I just wanted to say how much I appreciate this post and how glad I am that I stumbled onto your blog. We have just purchased our forever retirement home in Tennessee, which happens to be a 1926 farm house on ten acres. I am dying to get my hands on it!! The kitchen has shaker cabinets (some original and some custom made) which are my favorite. 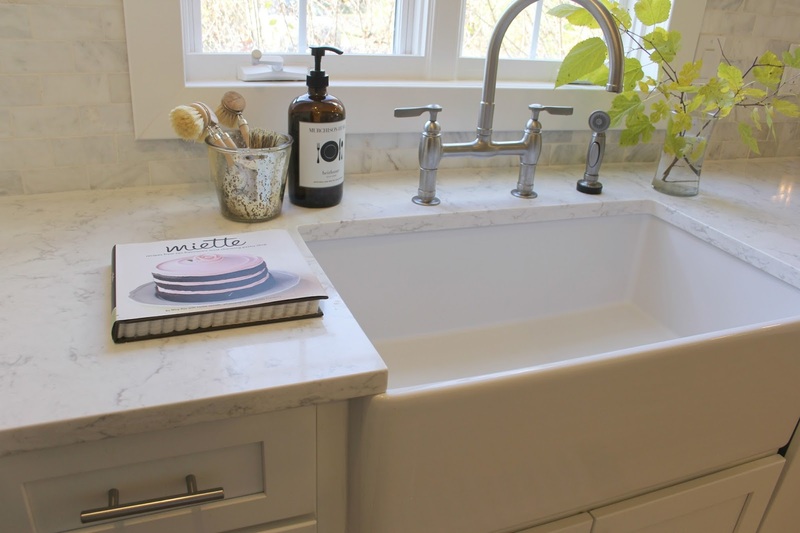 In my minds eye I want that Carrara Marble on one countertop with my farmhouse sink, but the realistic Mimi that I am, says go quartz. 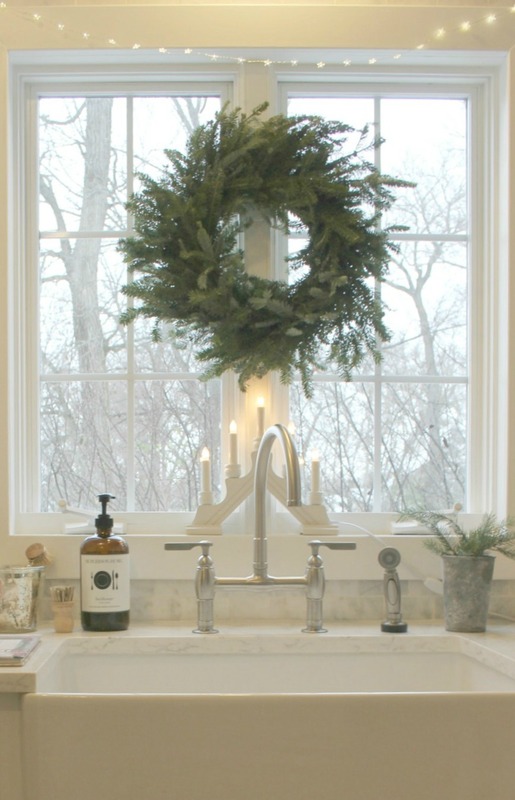 I am going farm house all the way and making an effort to meet my interior design preferences, while not creating an environment that will make me twitchy when the kids and grands are over. I believe you have nailed it for me with the LG Viatera Minuet!! 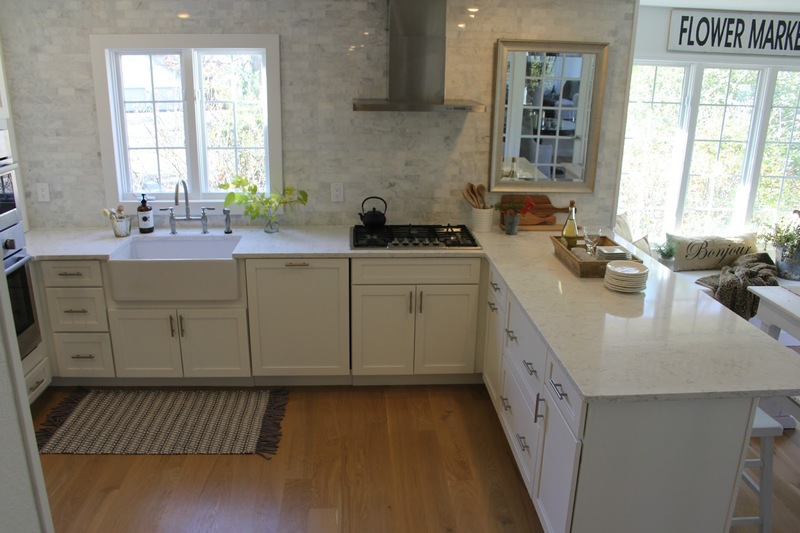 Going with a 3×6 bright white beveled subway backslash and butcher block top on the island and additional base cabinets, with open wood shelves above. So pleased to actually feel like there is a quartz I can be happy with. Do you think what Home Depot sells is the same product that you have pictured? Will be following on Facebook. Hi! 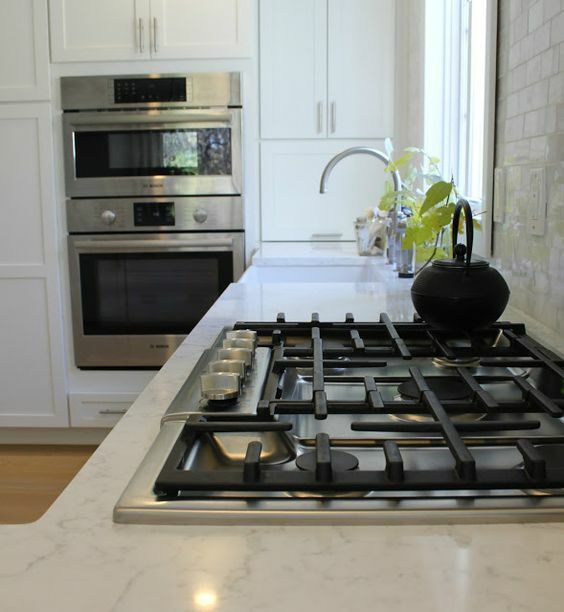 I am about to purchase the Minuet and working on the backsplash option – I love your’s…I see that you referenced it as “polished venatino marble backsplash” – where did you purchase? I bought a sample box of marble tiles from Lowe’s today (something like this https://www.lowes.com/pd/Anatolia-Tile-8-Pack-Venatino-Polished-Marble-Subway-Tile-Common-3-in-x-6-in-Actual-2-95-in-x-5-9-in/3477505) but each one is so different, how do you achieve a uniform, or at least cohesive, look? Thank you so much for your advice! We actually bought mosaic polished venatino tile from Lowe’s right here: https://www.lowes.com/pd/allen-roth-Venatino-Polished-12-in-X-12-in-Brick-Marble-Mosaic-Subway-Tile-Common-12-in-X-12-in-Actual-12-in-X-10-in/3502404 Hope this helps! I’ll add it to the post now. Thank you so much for reading. Well that is a wonderful thing to hear, friend! I’m elated that you love Minuet. Now we are quartz sisters! Thanks for reading and your support, and peace to you right where you are (in your beautiful new kitchen!). Hello, I need help! I am trying to decide what countertop I want for my kitchen. It is between carrera marble, minuet quartz or cirrus quartz. My cabinets are grey with a blueish hue. My floor is a Hadley grey plank polished white with grey tones. My appliances are black stainless steel. My backsplash will be polished pearl and Icelandic blue ice glass. My cabinets will be installed this coming Saturday and I need to decide!! It sounds absolutely gorgeous! Your first decision is between marble and quartz. Are you and your family messy cooks who spill red wine and splash marinara sauce like I do? That was one of the deciding factors for me in choosing quartz over marble. I don’t have any worries about staining and the porous nature of natural stone. 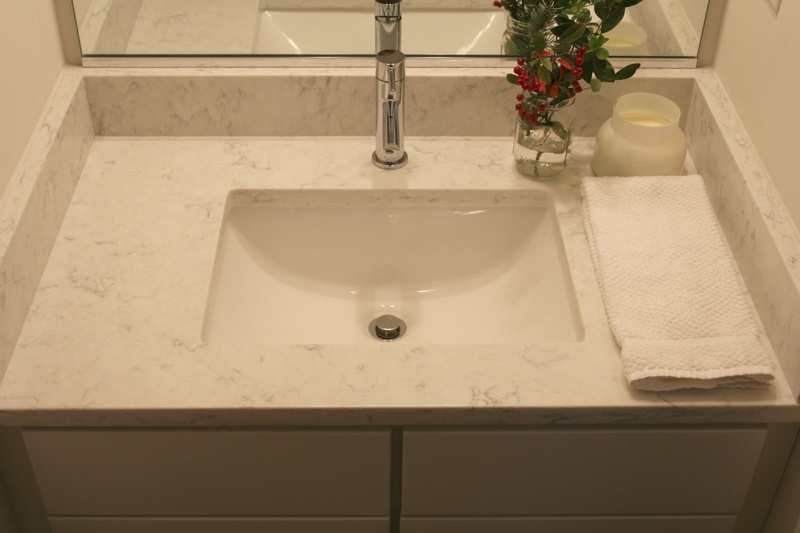 Carrara is beautiful though, and I live with it as a countertop in two of our bathrooms – I never tire of it. If you decide on quartz, Cirrus and Minuet are two of my favorites. I liked the painterly effect of Cirrus – sort of abstract and billowy veining with quiet undertones of blue and green. Minuet, on the other hand has crisper grey veining with no undertones – an effect that feels crisp and clean and French bakery-like or Parisian. 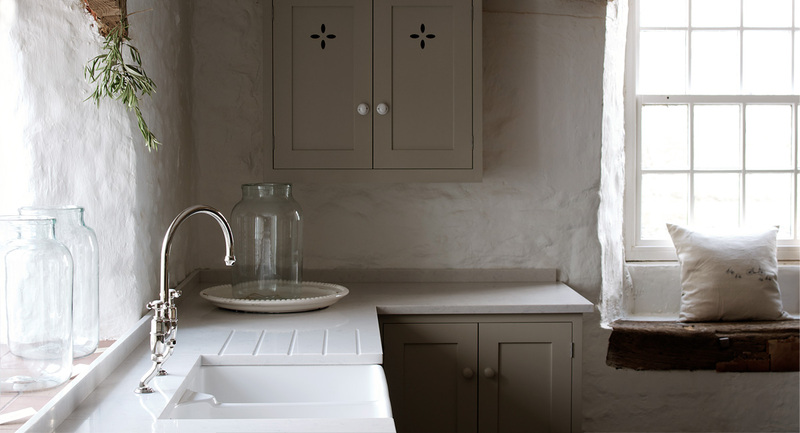 Still loving my Minuet which would be lovely with blue grey cabinets (so would Cirrus!). The ice glass sounds sensational. If you need to bring in softness with the counter, Cirrus might be a better pick. If you want things as neutral and alabaster as possible, then Minuet. Hope this helps, friend, thanks for reading! I am so happy I found your site. I love the Minuet and am also doing a shaker style white cabinet. I thought I wanted to use the Minuet as a backsplash and waterfall island as well. Would that work? Sure. They are by Schuler Cabinetry (through Lowes) and are maple with a White Icing painted finish. They were not finished on site, but rather were sprayed and finished at the factory. It has been 4 years, and they ARE showing little knicks in the finish and there are days it bothers me (when the sun is shining bright and I see every flaw). USE A KITCHEN DESIGNER FOR SURE. It is wise to consider whether your cabinets will take a beating because knowing that helps you select a finish! Painted finishes do indeed get chipped, flawed, and marred, and I haven’t found an easy fix to touch them up. This is an issue you’ll have to carefully consider: will it bother you to see them show signs of imperfection? You should trust a cabinet finishing expert with responses to your questions about the type of paint because there are multiple answers to your question. Many folks would recommend an oil based paint or a marine finish. Others would say a more matte finish can work as long as it is topped with the proper sealant/protective finish. You need samples that you can see up close and touch before proceeding to do a whole kitchen. Something I’ll be considering in my next kitchen is a two tone cabinet design with some stained, some painted, considering which ones get abused the most. Not a hodge podge, but for example, an island where the base cabinets are all wood/stained. Hope this helps. Thanks for a beautiful, interesting article. Did Viatera sponsor it or provide you with a discount to use their product? Since you didn’t mention it, I don’t think so but want to check before I dismiss other options (it’s a special order quartz/ more expensive where I am).